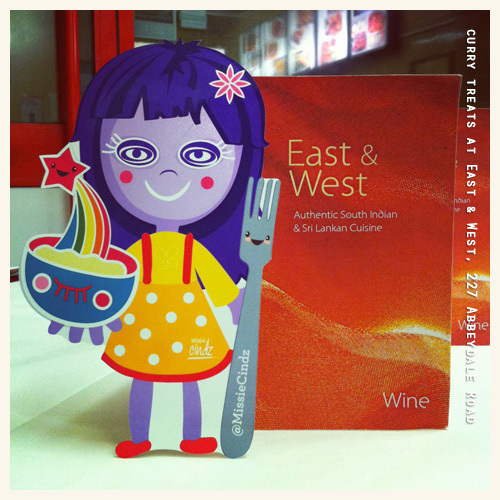 I had never tasted Sri Lankan food before so having dinner at East and West was something very new. I was really keen to give this place a go after reading all the enthusiastic foodie tweets and drooling over the photographs shared on twitter about this place (thanks @feastandglory for the recommendation). East and West is situated on Abbeydale Road, a small independent cafe-styled restaurant seating up to 20-25 people and calls themselves as serving the finest authentic South Indian and Sri Lankan cuisine. Our waiter, Siva was very friendly and welcoming, greeting us straight away and made us feel very welcome. 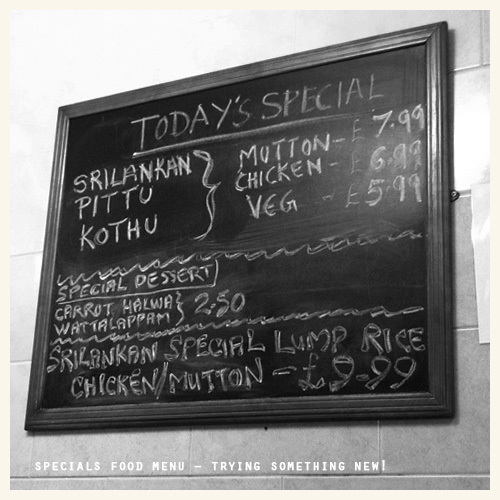 He pointed out the visual menu hung on the wall infront of us – if I’m honest, I’ve only ever had a curry probably no more than three times in my whole life! (yes, no joke) so this was certainly a departure from my normal food fare. After studying a varied and interesting menu; almost all the dishes were new to me so I asked Siva for his recommendations and daily specials. Siva was always happy to explain what the dishes were exactly and I appreciated his patience. I got a good feel from the staff and this made me want to return (this was before any of the food had even arrived yet! ), so as a heads up to all the people with businesses reading this; helpful and attentive customer service is key! Genuine smile and friendly services made all the difference. Our food appeared very quickly, a good thing, we were hungry! Complimentary poppadoms soon arrived after we chose our main. 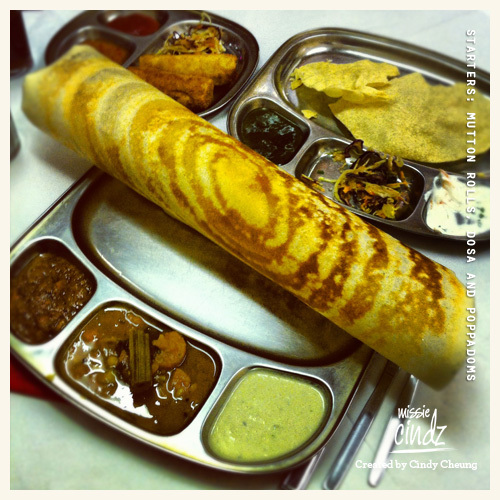 For starters included Mutton Rolls (rolled pan cake filled with mixture of mutton, onion and spices) and Masala dosa (a very light pancake/crepe made of urid dal (white lentils) and rice served with tasty sambar & chutney) – see 3rd photo. Our mains were all from the Day’s Specials menu; Meat and Vegetable Thali which I chose an additional fish curry to go with this too (although without it would had been enough food already). 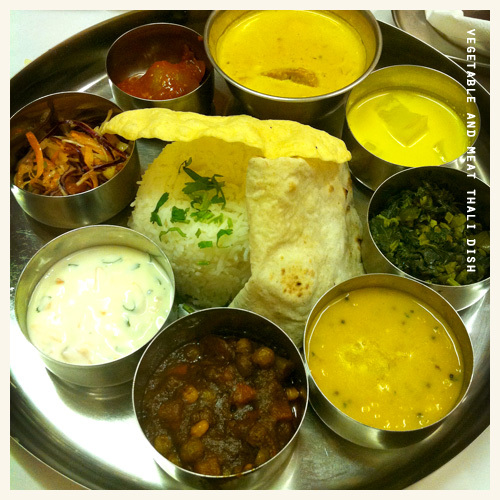 “Thali” meaning a plate in most Indian languages (and here were lots of plates!). My thali served in a metal platter with small, fitted bowls known as katori) featured a combo of dry and wet vegetable dishes, tandoori roti, poppadom, rice, pickle, curd, a sweet, meat and fish (tuna steak) – in short, this was a tasty platter of mini cute dishes of everything! – see 4th photo. 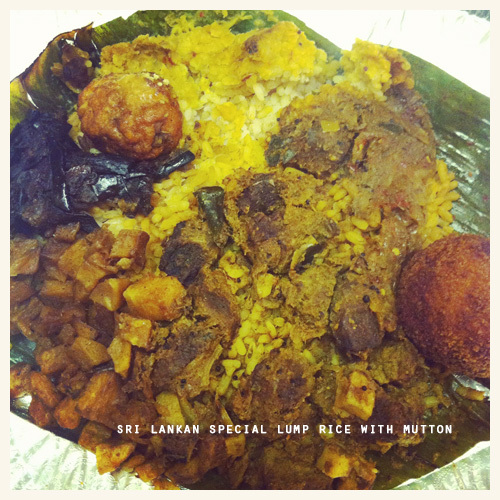 The Sri Lanken Special Lump Rice with Mutton was definitely tasty surprise. This was a huge mound of rice topped with eggplant curry, mutton meat, onion sambola, and a whole egg, which was hardboiled and then fried, plus other authentic native ingredients all wrapped and steamed in a banana leaf. This was a meal with a variety of wonderful flavours. The meat was tender and tasty and I enjoyed the tartness of the curry – although I must warn you, this was a massive meal for one and also very spicy too! (I lost count on the number of glasses of waters I asked for here). A lovely hint of pungency and earthy flavour came from the rice. Overall, if you don’t order anything else, this is a must try dish. Finally, next up was dessert. 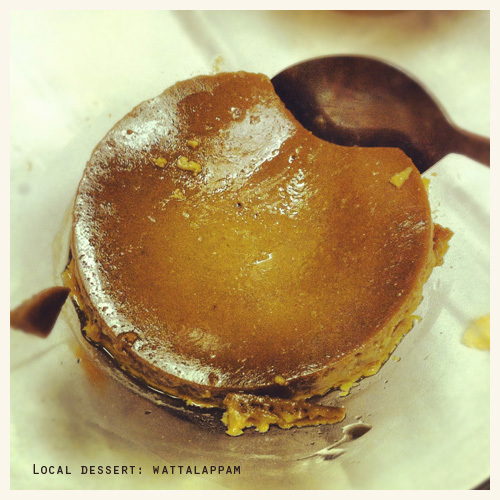 Although we were bursting at the seams, I was still curious to try and find out more about Sri Lankan desserts/puddings. The Watalappam (see photo above) is a traditional Sri Lankan dessert made with jaggery and coconut milk, brown palm sugar, cashew nuts, rice flour, treacle (Sri Lankan syrup), eggs and various spices including cinnamon, cloves, cardamom and nutmeg. 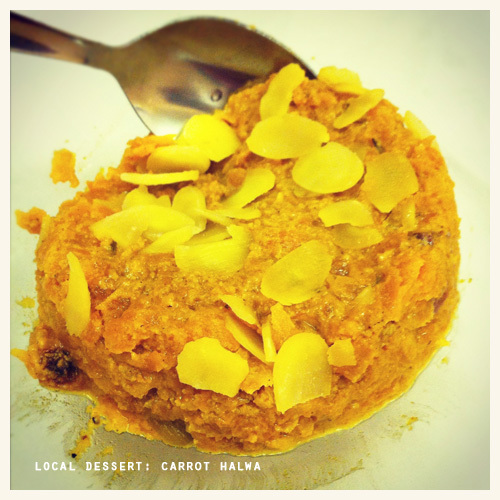 The carrot halwa, a very thick carrot and milk type pudding with strong flavours and chunks of ginger wasn’t my cup of tea. These puddings are definitely not your average apple crumble and custard fayre; after a mouthful of each I had to pass (well, I was stuffed too! )…I found them both interesting and I’m glad I still tried them though. When did I actually finish eating all this I hear you ask!? The food is certainly tasty and very filling, the mutton lump rice dish was the best of the main dishes. But if you’re a lightweight like me when it comes to spicy food (I wasn’t warned), then it would be best to ask for your food ‘mild or less spicy’ – Sri Lankan cuisine (in my opinion) is very spicy/hot with the use of chilli, cardamom, cumin, coriander and other spices. East and West is certainly worth a visit if you fancy something different from the usual curries served in Sheffield and was great value coming in around £17.00 per head (no alcohol). Thank you Siva, I was able to get a good introduction into Sri Lankan street and restaurant food.